Looking back, the past four weeks have been a whirlwind of activity. Before we were Team Hibachi, we were just a collection of students from near and far. Two programmers from Becker College, Chris Bruno and Rejon Taylor-Foster. Another from Northeastern University, Mackenzie Denker. Three artists with mixed skills in 3D modeling and digital painting from Rensselaer Polytechnic Institute, Rochester Institute of Technology, and Indiana University-Purdue University at Indianapolis; Uyen Uong, Melissa Chiu, and Sai Timmermann. One audio ninja from Berklee College of Music, Alex Ripple. When we started, we were individuals. Most of us didn’t know each other’s names. By the end of orientation week, we could recite everyone’s names and schools, but we didn’t know much else about each other. 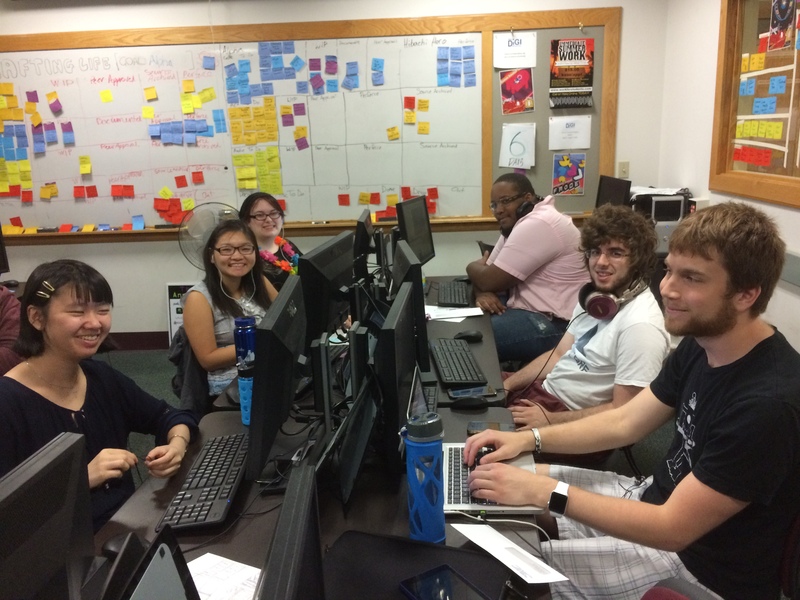 We were placed in a team together to work on an idea we had nicknamed “Zen Leaves”, a game where you control the flow of raindrops on a car window in order to push around leaves and other items that stuck to the window. The first days of development were difficult. We were excited to be working on a game, but we were struggling to find the “fun” within the abstract concept. By the end of the second day, we had made the bold decision to scrap “Zen Leaves” and start fresh. We each took five minutes to come up with a concept for a game that could be played with one finger then pitched the ideas to the rest of the team. We then voted on which ideas seemed the most fun, and decided that we would spend the rest of the day making small prototypes of our top three ideas. Each of our programmers worked on a separate concept, choosing to work into the evening so that we could make our decision first thing in the morning. We ended up setting aside two of the concepts: a tower-defense game where you protect a turtle crossing a busy road and a game where you tap on flashing squares to set off chain reactions to claim every tile on the map. Our remaining concept was a game where you used a slingshot to defend baby turtles from incoming hungry seagulls. We liked the mechanics of the game, but it didn’t take long for us to decide that we weren’t in love with the story behind it, and so we took some time to brainstorm other ideas that incorporated the mechanics we had built. The suggestion to slingshot knives at food clicked with the team, and “Hibachi Hero” was born. The idea to cook the cut food pieces on a grill at the bottom of the screen followed shortly after, and we ended up ditching the slingshot in favor of simply flinging knives at the food. By the end of the week we had a working prototype that we could bring to the Playcrafting Spring Expo at the Microsoft New England in Boston. We watched as various developers from the Boston area came by to try the game, and each of us noticed the same thing: people were fascinated with flinging knives. Even as they were giving us feedback on some of the weaker aspects of the prototype, they would continue to fling knives as if they were in a trance. We had found the fun. Since then, the team has moved away from our prototype and begun work on our alpha stage of development. We’ve expanded some of our features and trimmed back others, and we’ve spent a considerable amount of time and effort to perfect the feeling of throwing the knife. It hasn’t always been smooth sailing – one of our biggest disagreements was deciding what types of food should be included in the game – but our struggles have built us into a stronger, closer team. We’re about halfway through this roller coaster of an experience, and we can’t wait to see where the rest of the summer takes us. Team Hibachi, signing out!